The HRK-1 comes to the market at an affordable price and is built with unprecedented data accuracy, especially in higher diopter and cylinder measurement. 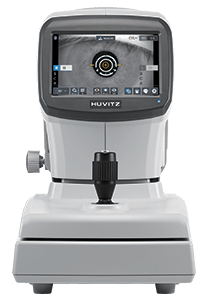 Utilizing dynamic optical technology to measure the aberration of the eye, this machine is the 8th generation auto refractor/keratometer developed by Huvitz, who has been actively pursuing continuous innovation in the product segment. Other features include full compatibility with all EMR Systems and Full Three Year Warranty. Iris and Pupil Diameter Measurement.